After emerging from bankruptcy restructuring in May 2008, Movie Gallery Inc., owner of Hollywood Video, sought to raise its profile among competitors such as Blockbuster and Netflix. After emerging from bankruptcy restructuring in May 2008, Movie Gallery Inc., owner of Hollywood Video, sought to raise its profile among competitors such as Blockbuster and Netflix. 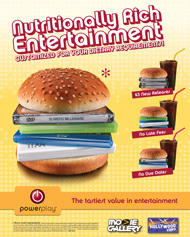 The introduction of a new membership program, PowerPlay, which offers discounts and no late fees, gave it a chance to use an integrated campaign to promote its new service and overall brand. With Cone's help, Movie Gallery focused on media outreach to become top-of-mind for reporters and consumers. “We wanted to communicate the incredible breadth you get from bricks-and-mortar, the immediacy, the experience of interacting with people who loved entertainment,” says Clifford Torng, EVP and CMO of Movie Gallery. The ads, from Cole & Weber, reinforced these messages. Movie Gallery targeted both consumer and business press, including The New York Times, BusinessWeek, and Bloomberg. “We went out with the new CEO and did desk-sides,” says Marc Berliner, account director at Cone and campaign lead. To reach consumers, Movie Gallery targeted entertainment bloggers and Web sites, providing copies of much-anticipated DVDs Quantum of Solace and Twilight for reader giveaways. Within the first three months, the company signed up more than 1 million PowerPlay members and the blogger outreach resulted in 20 giveaways. Torng says Movie Gallery is also featured more often in business and entertainment media. “We have some aggressive plans to continue to promote it,” Torng says. The company will also expand its customer base with other programs.